LEO recently headed to Boston to participate in the Shamrock Series events. 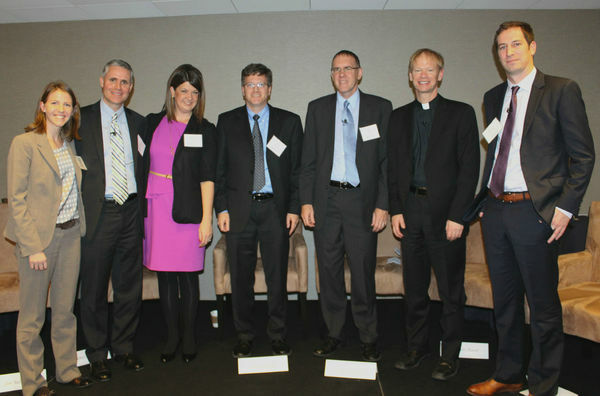 The University of Notre Dame’s Department of Economics hosted a panel, “Combining Research and Practice to Serve the Poor.” Alongside panelists from the Economics Department, Catholic Charities Fort Worth (CCFW), Catholic Relief Services (CRS), and MIT’s Abdul Latif Jameel Poverty Action Lab (J-PAL North America), LEO co-founder Jim Sullivan discussed research initiatives and findings. LEO co-founder and Chair of the Economics Department, Bill Evans introduced the panel and highlighted the importance of bringing together researchers and practitioners to do this important work. LEO’s partnership with CCFW provided an example of the research experience from both an academic and service provider’s perspective. Heather Reynolds, CEO of CCFW explained the impact of LEO’s research on the Padua Pilot and Stay the Course programs at her agency. Research results, according to Reynolds, allow service providers to refine and scale their practices in order to impact more individuals. LEO co-founder Jim Sullivan further explained how the outcomes and cost-benefit analyses are disseminated to impact policy. LEO is grateful for the opportunity to speak to a large and diverse audience in Boston and hopes to continue the conversation about the importance of impact evaluation in the social service sector.All panelists stressed the value undergraduate research assistants contribute to research. At LEO, undergraduates work in the field at partner agencies and also support the researchers at LEO in the summer and during the school year. This proves mutually beneficial as LEO is able to take on more projects and the students gain valuable experience working directly with service providers, writing reports, researching issues and doing data analysis. For more information about the Shamrock Series, please visit Notre Dame News. For more information about LEO’s research, look to the ND.edu article: Measuring What Works. Originally published by Elisabeth O’Toole at leo.nd.edu on November 30, 2015.